People who are allergic to peanuts may also be at risk of severe allergy to lupin flour, research suggests. Lupin flour is used in some European countries as a replacement for soya in speciality breads and catering foods, some of which are now reaching the UK. The researchers said people with peanut allergy - about 1% of the UK population - should avoid any products containing it until they had another allergy test. The study, by the Royal Free Hospital, London, is published in The Lancet. The Royal Free team highlighted the case of a 25-year-old woman who, in August 2004, had an allergic reaction after eating a restaurant meal of chicken, French-fried potato, and onion rings. During the meal, her mouth itched and her lips and tongue started to swell. Fifteen minutes later she was having difficulty breathing, her throat had narrowed, and she felt very weak. An ambulance was called, anaphylaxis - a life-threatening allergic reaction - was diagnosed, and she required emergency hospital treatment before making a full recovery. The woman knew she had a severe allergy to peanuts after a reaction to a peanut sweet when she was 15. 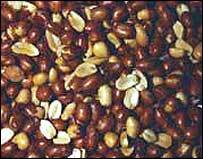 However, peanut contamination of her food was considered unlikely. Lupin flour, an ingredient of the onion ring batter, was eventually identified as the cause of her attack. The prevalence of lupin allergy has increased markedly in some countries, especially France, which permitted the addition of lupin flour to wheat flour in 1997. 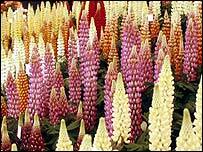 Although the food use of lupin has been permitted in the UK since 1996, few lupin-containing foods are so far on sale. A new directive on food labelling came into force in Europe in November 2004, requiring food manufacturers to specifically list 12 potential allergic ingredients. However, lupin flour was not included on this list, despite recommendation from the UK-based Institute of Food Science and Technology. Researcher Dr Michael Radcliffe said: "Further work will be required to establish the prevalence and significance of lupin allergy. "Meanwhile those with peanut allergy appear to be at particular risk as up to half may be pre-sensitised. "They should be advised to avoid all products containing lupin until they can be specially tested." David Reading, of the Anaphylaxis Campaign, told the BBC News website it was important the potential problem was flagged up now, before lupin flour-based products became more widespread in the UK. "We are aware of a handful of cases where people have almost certainly reacted to lupin flour, but thankfully it is small problem at the moment because only a small number of products contain the flour," he said.